[167 Pages Report] The needles market is expected to reach USD 8.47 Billion by 2022 from USD 5.82 Billion in 2017, at a CAGR of 7.8% during the forecast period. Base year considered for the report is 2016 and forecast year is 2022. This research study involved the extensive use of secondary sources, directories, and databases (such as Hoovers, Bloomberg Business, Factiva, and Avention) to identify and collect information useful for this technology-based, market-oriented, and commercial study of the global needles market. 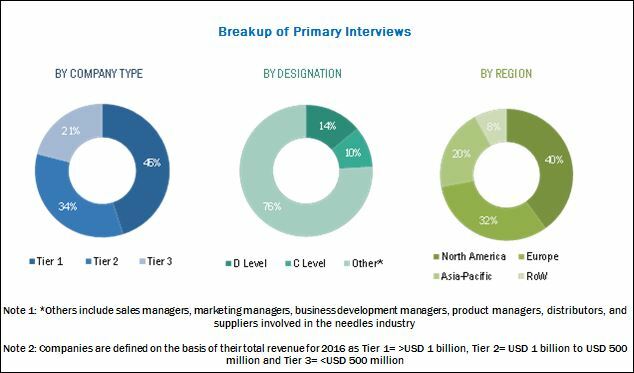 In-depth interviews were conducted with various primary respondents that mainly included key industry participants, subject-matter experts (SMEs), C & D level executives of key market players, and independent industry consultants, among others; to obtain and verify critical qualitative and quantitative information as well as to assess future market prospects of the global needles industry. The secondary sources referred to for this research study include corporate filings (such as annual reports, SEC filings, investor presentations, and financial statements); research journals; press releases; as well as articles published by various trade, business, and professional associations. Hamilton Company (U.S.), Medtronic plc (Ireland), Becton, Dickinson and Company (U.S.), Stryker Corporation (U.S.), B. Braun Melsungen AG (Germany), Boston Scientific Corporation (U.S.), Terumo Corporation (Japan), Novo Nordisk A/s (Denmark), Smiths Medical (U.K.), and Thermo Fisher Scientific (U.S.) are some of the key players in the global needles market. These players are striving to expand their presence in the emerging countries of Asia and the Middle East & North Africa (MENA) region through product launches, partnerships, product approvals, and collaborations. The global needles market is projected to reach USD 8.47 Billion by 2022 from USD 5.82 Billion in 2017, at a CAGR of 7.8% during the forecast period. 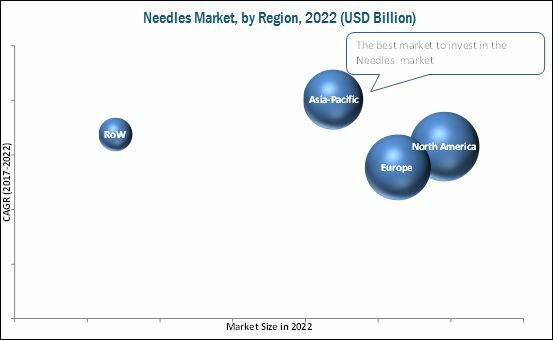 The growing geriatric population, increasing number of hospitals in emerging markets, high prevalence of chronic diseases, and increasing demand for vaccines are the major factors driving the growth of the needles market across the globe. This report broadly segments the needles market into type, products, material, delivery mode, and end user. On the basis of type, the global needles market is segmented into two broad categories, namely, conventional needles and safety needles. The global safety needles segment is expected to grow at a higher CAGR from 2017 to 2022, owing to the increasing awareness regarding the use of safety syringes and need to reduce needlestick injuries. Based on product, the needles market is segmented into suture needles, blood collection needles, ophthalmic needles, dental needles, insufflation needles, pen needles, and other needles. The pen needles segment is expected to hold the largest share of the needles market in 2017. The demand for pen needles is expected to increase with the growing prevalence of diabetes. Around 415 million people had diabetes in 2013, worldwide; by 2040, this figure is expected to increase to 642 million (Source: International Diabetes Federation). Thus, with the increasing prevalence of diabetes across the globe, the demand for pen needles will increase during the forecast period. On the basis of the delivery mode, the needles market is segmented into hypodermic, intravenous, intramuscular, and intraperitoneal needles. The hypodermic needles segment is expected to account for the largest share of the needles market in 2017. These needles are used for injecting drugs into the subcutaneous layer of skin; this enables the quick absorption of active compounds into the bloodstream, which is the key factor contributing to the market growth of this segment. The needles market is segmented into stainless steel/metallic, plastic, glass, and PEEK needles, based on materials. The stainless steel/metallic needles segment is expected to account for the largest share of the needles market in 2017. Stainless steel/metallic needles are affordable and do not rust; they can also be sterilized and reused; these factors are contributing to the large share of this market segment. By end user, the needles market is segmented into hospitals, home healthcare, diagnostic centers, and other end users (trauma centers, blood banks, nursing homes, and acute care centers). The hospitals segment is expected to account for the largest share of the needles market in 2017. Growth in the healthcare sector in emerging economies and the increasing out-of-pocket healthcare expenditure across the globe are the key factors contributing to the market growth of this segment. Geographically, emerging Asian countries offer high-growth opportunities for market players. As of 2017. The conducive regulatory policies for the approval of new injectables and rapid growth in the geriatric population are key factors influencing the growth of the Asia-Pacific needles market. However, the rising needlestick injuries and infections, use of needle-free technology, and growing focus on the development of alternative drug delivery methods are the major factors that are expected to restrain the growth of this market. A majority of the leading players, including Medtronic plc (Ireland), Ethicon US, LLC. (U.S.), Thermo Fisher Scientific Inc. (U.S.), Novo Nordisk A/S (Denmark), Becton, Dickinson and Company (U.S.), Stryker Corporation (U.S.), and Boston Scientific Corporation (U.S.), among others in the needles market are developing advanced needles enabled with safety features to secure their position in the market. Companies also focus on upgrading their product offerings and expanding their distribution networks to gain a larger share of the market through partnerships and collaborations. 13.16 Thermo Fisher Scientific Inc.